Sure spending the last day on the ice for the season in the rain was bitter sweet but the fish made things better. I had planned on spending the day packing away gear and setting my boat up for the seasons coming up but I am easily convinced when fishing is involved. I stayed in bed catching up on sleep from the last two days until I got the urge to hit the ice somewhere I knew people would be. Upon arrival, I unloaded and hit the water. The shores were weak but fortunately the abundance of docks allows for easy access. The bite was spotty but when the crappie were there it was insane! 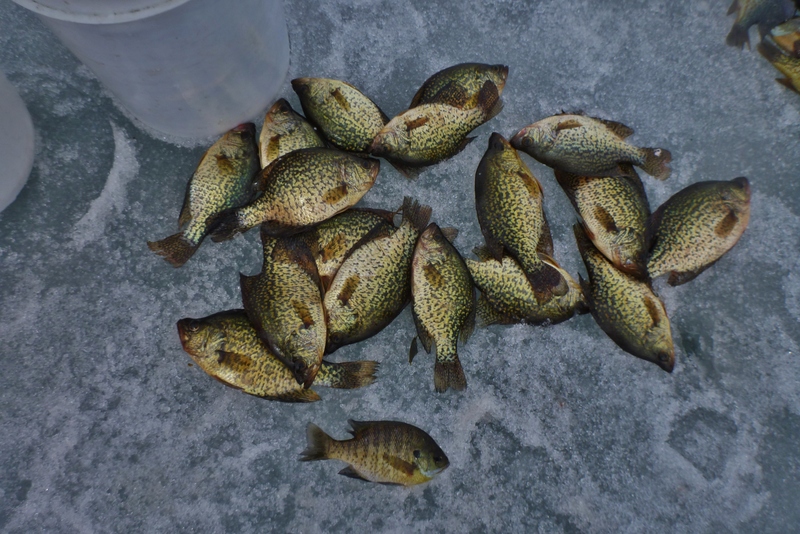 While it wasn’t a usual tactic, calling everyone over when a crappie was caught was key to having them stick around for a bit rather than moving on quickly like they wanted to. As a precursor of good things to come, pumpkinseed indicated that the crappie would be along shortly. After fishing for about 7 hours, I had a nice load of crappie as well as some good pumpkinseed and bluegill. While ice season may be over for me now, I don’t think it will be long before I am back on the water again!